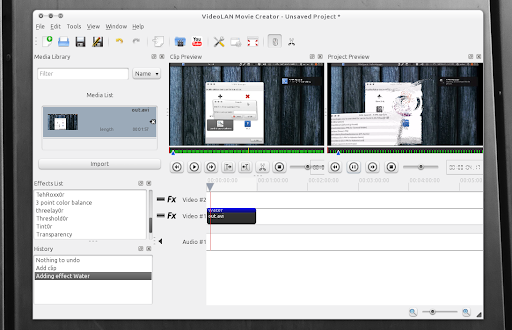 VLMC (VideoLan Movie Creator) is a new video editor, currently in alpha, built by the VLC developers. Did you know we maintain a daily builds VLMC PPA? I bet most of you forgot because we haven't published anything about it in a while. The development is quite slow, but something very exiting landed in VLMC recently: video effects. Update: The latest VLMC makes use of frei0r-plugins, a simple cross-platform framework for video effects that provides filters, mixers and generators by means of minimalistic plugin API. That means that the effects might have been available in VLMC for a while but I didn't notice this until now. The effects include 3dflippo, baltan, color distance, edgeglow, luminance, transparency, vertigo, water and lots more. Unfortunately the Lucid builds are not working as I need a stable VLC 1.1.x PPA for Lucid to use for building VLMC, but to install it in Maverick you can use our daily builds PPA - don't worry, it won't break anything as the PPA only has VLMC. Please note that VLMC is still in alpha, so expect to find a lot of bugs!